Tarot is one of my favorite divination tools. Suitable for gaining insight into any question or situation, we can ask the cards for clarity and useful information for complex situations. The spirit of the cards is strong, and they often have a mind of their own. My divination style, much like myself, is a blend of intuitive and learned. 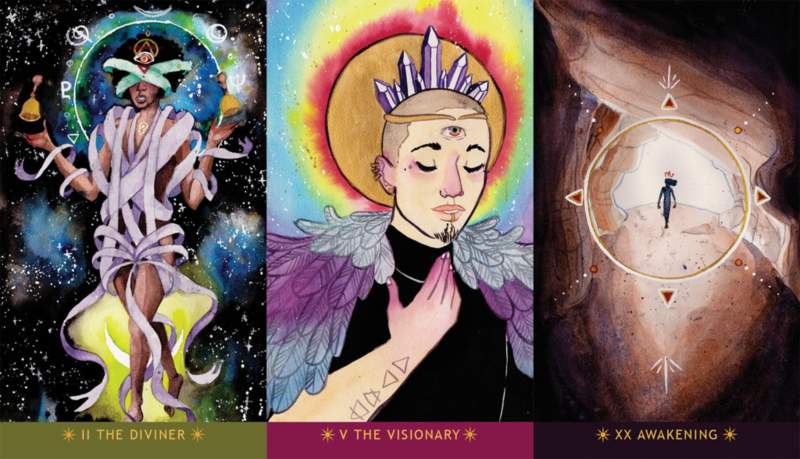 I rely both on the traditional meaning of the cards, taking into account both the artist’s descriptions and more hermetic and astrological card associations as well as the relationship between the cards meanings, symbols, colors, shapes, etc. I currently read primarily with The Numinous Tarot, a sample of which are depicted above. This deck is full of vibrant life and has a queer bent to it. I am also very familiar with the Thoth Tarot Deck, having previously read with the Thoth for nearly fifteen years. If you would prefer me to read with your own deck or another deck that I own, I would be happy to accommodate you. Readings can occur in person at my session space in the Columbia City area of Seattle, or distance via phone or Zoom video.